Mundo de Unas has reopened international shipping, and you know for me that's a reason to celebrate! I so love my MdU stamping polishes. I couldn't decide on one color to stamp with today, so I used six in this double stamped gradient manicure. I started with a base of Daisy Duo Muted Berry. When I received this one as a press sample from Esther's Nail Center, I knew it would be the perfect base for this mani. Wanna see a swatch? I thought you might. Muted Berry is a gorgeous dark purple cream. Definitely a perfect fall color. Application was quite smooth and I found this gel polish to self level well. As a darker color, I did find it needs to cure a little longer than the lighter colors, but that's common with darks. As usual, I have swatched three coats below. I then created a gradient stamp with the rough circles image from Pueen 47 from the Love Elements Set and Mundo de Unas 36 Forest, 54 Iris and 45 Metallic Violet. This is the base stamping. The second gradient is Mundo de Unas 46 Mustard, 53 Geranium, and 51 Tulip using a portion of the image from Pueen 59 from the Buffet Set. I didn't think to snap a photo of just the bottom layer of stamping, but I did snag a few shots of the images still on the stamper. 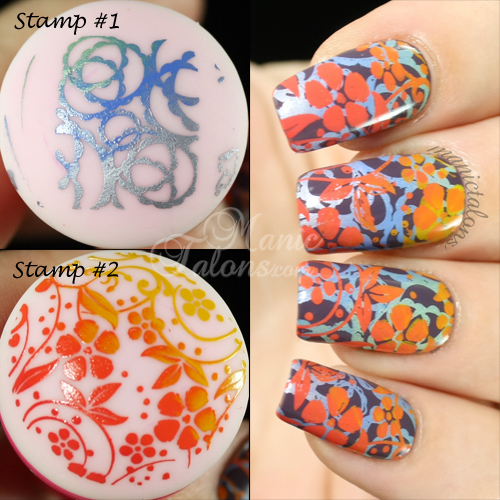 For more info and a how-to on gradient stamping, check out my previous gradient stamping post here. Want to see a few more shots? What do you think? 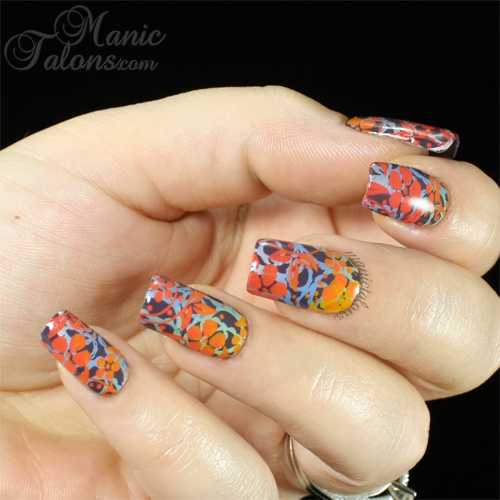 Is this style of stamping something you would wear? *The Daisy Duo Muted Berry featured in this post was provided by Esther's Nail Center for my honest review. All other items used were purchased by me. This post includes Amazon Affiliate Links. Purchases through these links generate commissions that help fund this site. All other links are non-affiliate links. Hello Loves! I'm finally starting to feel a bit better, so I decided to celebrate with another swatchathon. I have the full IBD Just Gel Floral Metric Collection to show you today. :) Wanna see them? Of course you do! I'm generally pleased with the colors in this collection. From the IBD color dots, I didn't think they would really speak to me, but thankfully those dots were wrong. For the most part, the collection is consistent in that it applies well. Of course, with every IBD collection there seems to be that one polish that just isn't up to par. Wanna guess which one? Let's get to the swatches, shall we? The first color in the collection is one that really doesn't seem to fit with the color scheme to me. Flowerful is a light peachy pink cream. I would almost call it a bleached neon. Sadly, this one is also the dud in this collection in my opinion. I gave her a vigorous shake with my Robart paint shaker and she still didn't want to behave. (Side note: If you don't have a Robart, you don't know what you're missing! Seriously, this little shaker is key to making difficult gels behave.) The photos below are 4 coats - yes, four coats - and it's still a bit streaky. So sad! She really is a lovely shade. Undies might make her behave, but I have yet to try. The streaks show much worse in person than they do in the photos. Next up is Retro Rosette. 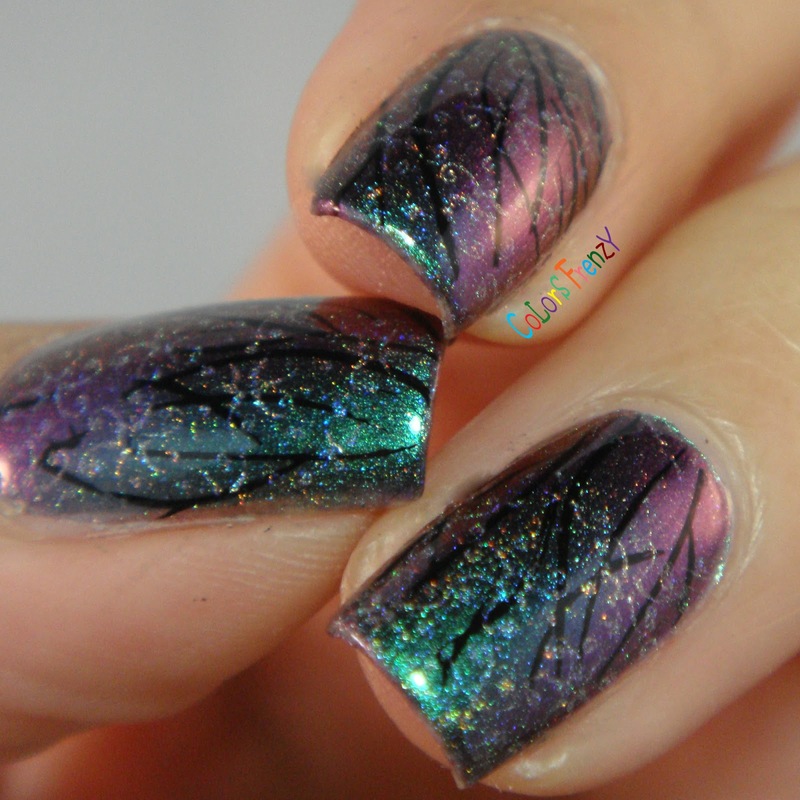 Now this is a gorgeous polish! I would love to say that I captured her in all her glory, but sadly I did not. The swatch photos below are as close as my little Canon could get (they are close, but not perfect). In reality Retro Rosette has a bit more of a magenta tone with a purple glow. She's a cream finish with flawless coverage in three thin coats (two if you apply a little thicker than I do). I even tried to capture her with a video, but that failed as well. So imagine her a bit brighter, bolder, and tons more fun! The non-bottle shot is closer to her true tone than the bottle shot. Looking at that photo, imagine the same color but more vibrant. Hippie Dippie is a slightly dusty blue that just makes my heart sing. Seriously, you know how much I love my blues, right? So I guess it's no surprise that I love this one. Application was quite dreamy and she was opaque in two coats for me. Folklorical is one of the two glitter toppers in the Floral Metric Collection. This is a clear base with silver micro glitter and larger white hex glitters. Honestly, this one doesn't really wow me. I love the shimmer, but the white glitters were a little tricky. I had to do some fishing even after shaking the heck out of it. Shown below is three coats. Patchwork is a slate grey cream. This one doesn't excite me as much as many of the others. I'm not really sure why. It is a nice shade, but I think I've seen too many that are close to it lately in other brands. She's definitely a good addition if you need a nice, medium grey though. Application was great with this one as well. She's opaque in 2-3 coats and self leveled nicely. Petal Imprint is a slightly maroon toned brown cream. I found that I really, really like this shade. Browns are usually difficult for me to love because they don't always work well with the yellow undertones in my skin. The mild maroon tones seem to work well for me in this one. Application is similar to Patchwork - she's opaque in 2-3 coats and leveled beautifully. Finally, the second glitter in the collection is Banjos Make Her Dance. And well, yes...yes they do. I do enjoy a good banjo...but that's another story for another day. Banjos Make Her Dance is a clear base with scattered gold, red, brown and orange micro glitters. On her own, she really isn't much to write home about. Of course I swatched her anyway - every girl needs her chance to shine. Below is three coats. Wait...let me show you why I love her! Banjos Make Her Dance is absolutely stunning when layered over a dark base. Especially when that base is a brown that allows the glitters to really pop. Below is one coat over Petal Imprint. The second photo without the bottle shows it best (slightly blurred to capture what I see with my eyes). What do you think? Are there any colors in this collection that need to find their way into your collection too? I definitely see myself using some of these for fall manicures this year. Especially Eye-Poppie, Hippie Dippie, Petal Imprint and Banjos Make Her Dance! Hello Loves! I have another Bundle Monster Gel Polish collection to show you today - the Woodland Fantasy Collection. This collection consists of a rainbow of 6 gorgeous glitter polishes in jelly bases. They are available for purchase as a set or individually on Bundle Monster's Website as well as on Amazon. These polishes are quite thick and packed with glitter, so two coats provides sufficient coverage in my opinion. Many of the gels do show visible nail line in two coats, but I felt that three would be a bit more glitter than I like. Since they are thicker, they can be a little tricky to work with, but I think the end result is well worth a few extra strokes to keep them thin on the nail. The thickness of the gels in this collection are definitely due to the dense glitter load, and the added bonus is that they don't pool or shrink like a lot of jelly bases. I went against my normal three coat swatch routine with these and swatched just two coats instead. The first polish in the collection is Ice Queen. Ice Queen is a beautiful, crystal blue jelly base with silver holographic glitter. 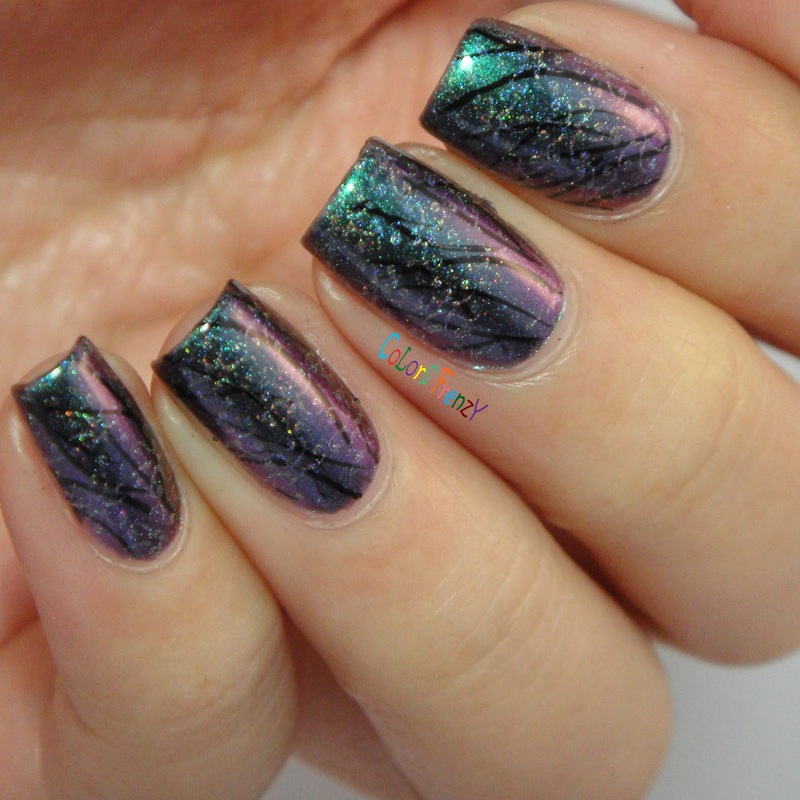 Nightingale is a medium to light purple jelly base with silver holographic glitters. This one provides slightly better coverage than Ice Queen in two coats. Pixie Dust is a bright lime green jelly base with the same silver holographic glitters. Royal Nectar is a salmon pink jelly base. Again, with the same silver holographic glitters. Tangerina is a tangerine orange jelly base with, you guessed it, silver holographic glitters. Finally, Twinkle Rose is a rose pink jelly base with the silver holographic glitters. As you can imagine, I couldn't resist creating a vertical gradient with the Woodland Fantasy Collection! The colors pair so well together and transition beautifully from cool to warm. For the gradient, I started with a white base and then applied two layers of each shade using the one-stroke technique shared here by Nails by Shannon. I should have flipped Tangerina and Royal Nectar in my gradient, but I still think it turned out quite nicely. Which of these gorgeous glitter polishes is your favorite? Or are you like me and need the entire set? You know I can't resist a pretty glitter! 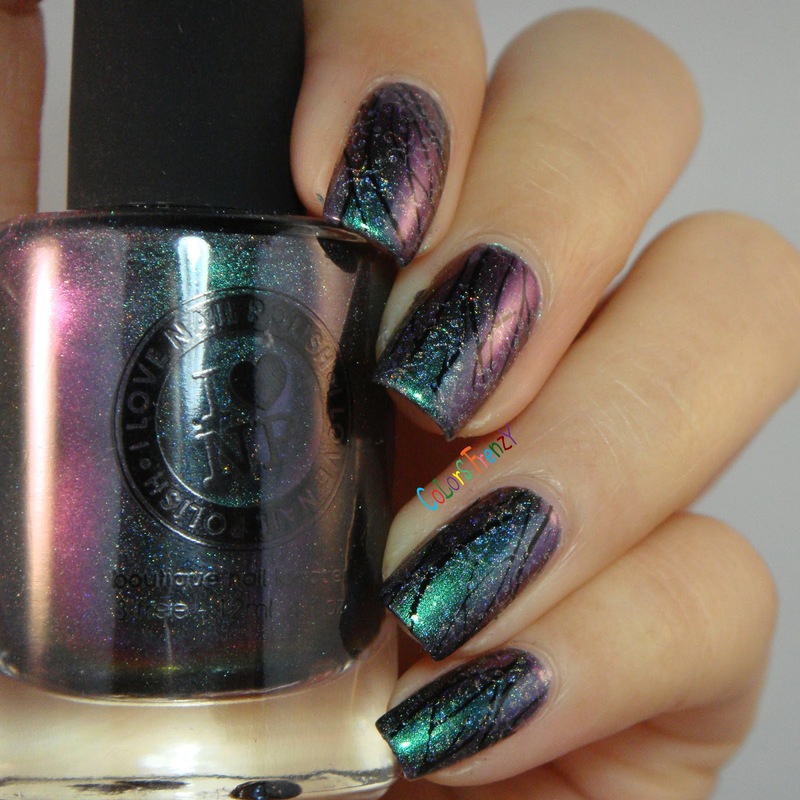 *The polishes featured in this post were provided by Bundle Monster for my honest review. This post uses Amazon Affiliate links. Purchases through these links generate commissions that help fund this site. I'm Novi from the blog Colors Frenzy. I'm excited to be guest posting for Michelle, I've only known her for a little while through a facebook group, but I have always admired her creation. Not to mention almost all of them are done over gel polish, something I'm very unfamiliar with, and she does it like a pro! The manicure I'm sharing with you today is a double stamping over a super gorgeous multichrome polish from ILNP, Sirene (H). I started with applying 3 thin coats of the base color and used a fast drying top coat. Then I stamped the image from Pueen Encore set, plate SE04A with Mundo de Unas Black. The second stamping is way more subtle, since I wanted to still show the color shift. I used the image from MoYou Pro plate 15 and ILNP Mega. 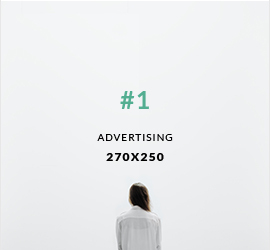 They might be a tad too subtle, but I love it, it's like a hologram card that you'd have to tilt to one side to get a different image to show, know what I mean? I sealed the stamping with HK Girl top coat. Hope you guys enjoyed the post, and thank you so much Michelle for having me here! Hello Loves! It's time for my final Blogiversary Giveaway! Whew, what a month of awesome prizes. :) Ready to see what I have to give away this week? 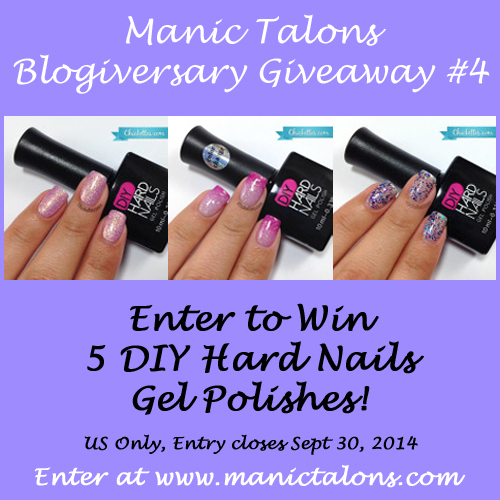 I have partnered with DIY Hard Nails to offer this week's fabulous giveaway! 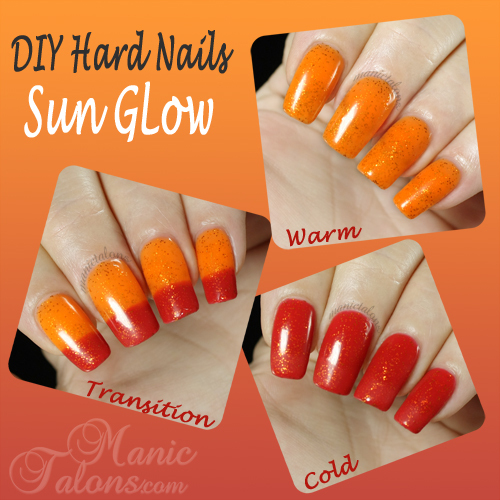 In case you missed it, you can read my DIY Hard Nails review with full wear test and removal results here and see additional thermal swatches here. Contest begins September 23, 2014 at 12:00 am EDT and will end on September 30, 2014 at 12:00 am EDT. Contest is open to US mailing addresses only. The prize will be fulfilled by DIY Hard Nails. Unable to view the Raffle Copter Widget above? Click here to enter! *The contest prizes offered in this giveaway were supplied DIY Hard Nails. Hello Loves! 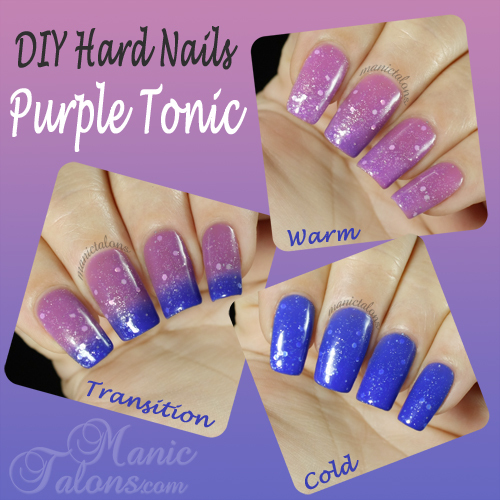 As promised, I have three more DIY Hard Nails thermals to show you today. Sun Glow, Jade Glitz and Purple Tonic. These three definitely satisfy my need for funky color changers. 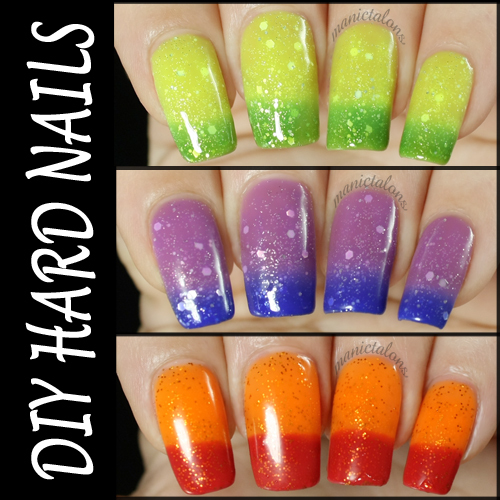 :) If you missed my full review and wear test of DIY Hard Nails, be sure to check it out here. So, onto the swatches. The first gorgeous polish I have to show you is called Jade Glitz. 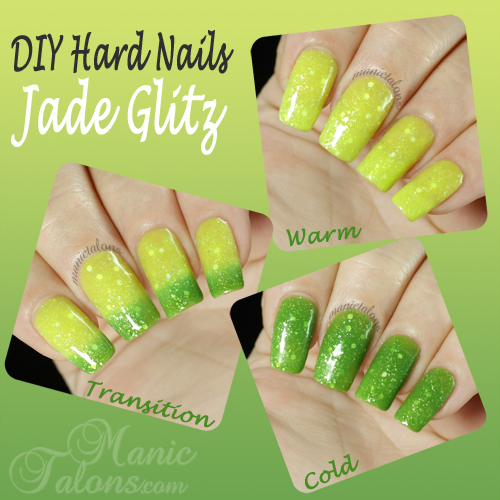 Jade Glitz is sweet little number that shifts from Mellow Yellow green when warm to a very pretty lime peel green when cold. She is also loaded with multiple sizes of silver glitter, thus the glitz. ;) Application is as expected with DIY Hard Nails - she went on smooth and leveled nicely. I did feel I needed three coats for this one to hide my stubborn VNL in the completely warm phase, but it honestly didn't stay completely warm on me for long so the third coat was pointless. By the way, Jade Glitz is THE perfect base for the citrus image on Bundle Monster BM-308 plate. I totally stamped it to prove it, then forgot to take pictures before I removed it. Definitely not my smartest moment, and I can't even blame that one on the medication. 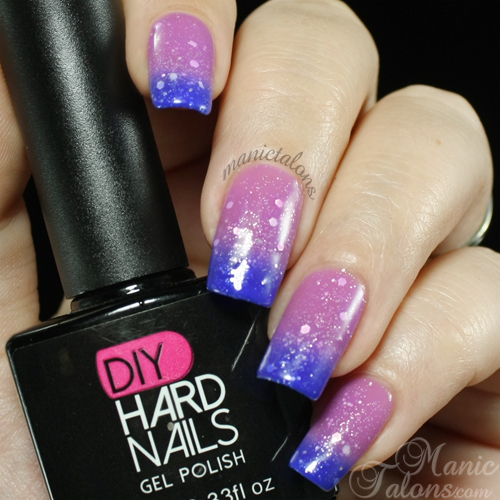 *The gel polishes featured in this post were provided by DIY Hard Nails for my honest review. This post uses Amazon Affiliate Links. Purchases through these links generate commissions that help fund this site.